Great comforter! Perfect to keep on my bed during all seasons! Very soft and comfy! Love the purple color and that it's reversible too! Would definitely buy more for other rooms at my house. 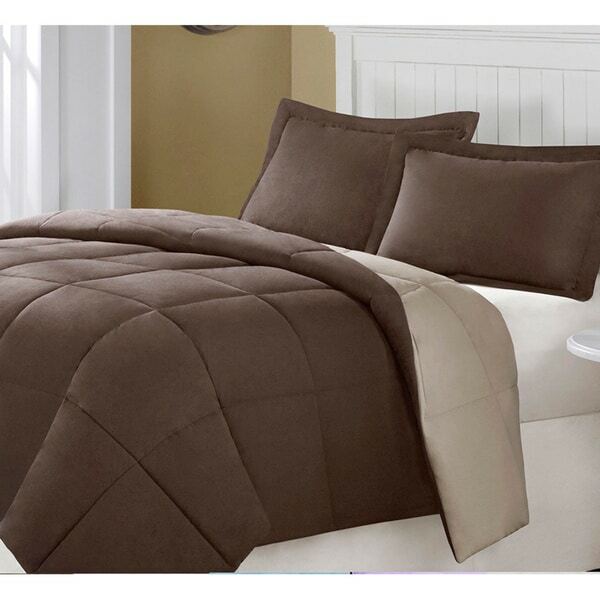 Add a fresh touch of plush warmth to any bedroom with this excellent reversible comforter from Superior. Rated for all-season warmth, this excellent comforter features a microfiber shell with polyester down alternative fill in the baffle-box design. The premium design comes in an impressive variety of color options for an impressively versatile complement to any decor style. I was hesitant to buy this comforter because I could tell from the pictures that it would be lumpy. It does appear lumpy in person but I can't complain too much for the price, although if it had been in the 30-40 dollar range I would have been happier. Shipping was extremely fast! I ordered it on Saturday and received it on Tuesday :0) I ordered a King for my queen sized bed and have a lot of overhang which I like. The comforter itself is soft the material is really thin but I don't have any pets so I don't think that will be an issue for me. There were some slight imperfections in the stitching and it had some lose threads here and there but nothing major for me to send it back. Overall I am satisfied with the product, it isn't super poofy but not really flat either. I would recommend it to others if they are looking for an inexpensive down alternative and would buy it again if it were cheaper. BTW, I got the black/gray and the colors matched the picture. I like this comforter a lot. The (taupe & chocolate) colors are true to the colors shown in the picture, and I like the texture of it too. I bought it for my son's bed but it's a little heavy for summer so we're setting it aside for the fall. My only complaint is the size. He has a queen bed, so I vacillated between the full/queen or king size. Based on the sizes shown in the spec details, the king seemed too big (90x106) so I went with the full/queen which said 88x90, but in reality it's 86x89. I wanted the comforter to be long enough to meet the bed skirt, but it really doesn't. We're keeping it anyway though, and just pulling down the side that shows to meet the bed skirt. Other than that I'm pleased with it so far. This comforter was a replacement for a previous selection and proved to be the best of all. It arrived two days from Sunday order. 10%off. The color of Sage was hard to find and the reversible design adds to the value of this luxurious full/queen size comforter.} Life these days can be stressful but here technology seems to have reached a plateau of expertise. The microfiber fill was very lofty and thick and and held air in the square quilts much like down. I was even able to get it back in its useful storage bsg for traveling without a struggle. I own an overstuffed goose down quilt and can appreciate how well this approximates the feel of down over fibers in the long years past with the advantages of durability and convenience. Very glad I made the purchase from this company. I can be critical but they did all things very well. (Now if I could only access my account to thank them directly I would be all set. Instead this may look like a 3rd party review but it isn't. Loved this comforter when it first came out of the box, though much thicker than I'd expected. The fabric is nice and soft, not too slick,--indeed luxurious. Be warned, however, this is NOT an all-season comforter. It is way too warm even on our coldest Idaho nights (our heat is down to 52F in the house). Also, I soon noticed a little pucker in the fabric where I could see a bit of insulation poking through, and this proved to be a fatal flaw upon washing the comforter. When the puppy we were babysitting peed on it, I had to wash it. Mine is a king-size, and it barely fit into my large capacity washer. When it came out, that puckered place had opened a few inches and insulation was coming out. I'm not returning it, because I felt the tear is partly my fault for stuffing the comforter in the washer. I am usually cautious to buy bedding I can get in the washer (e.g., cotton quilts), and, since this was rated all-season, I thought it would be lighter-weight and ok. A single person sleeping in a cold room would probably enjoy this comforter. It looks nice and color is as pictured. If you buy this item, inspect carefully for flaws before using and be warned you might have to use a large commercial laundramat machine (none of those in our area). Great for Texas nights - cool to cold. This is really nice. It is smooth to the touch. I love the dark brown color. Thick and plush filling. Looks great on the bed. Comforter has everything you want. You will not be disappointed. The description of "Luxurious" is exactly what you are receiving. Very soft and warm without being too heavy. I ordered the taupe/cream color and it is beautiful. It has baffle boxing which keeps the fill in place. Nice fabric and colors with a lot of loft! I purchased chocolate/taupe in twin size to use as a "TV watching blanket" on chilly nights and it's big enough for two to share. The colors are nice and accurate in the photo. Nice silky soft fabric, well constructed (double stitched edge), and a lot of filling loft. Provides just the right amount of toasty warmth. Twin size is big enough to use as an extra blanket on queen bed (no extra hanging over the sides). Wonderfully warm alternate to down. I even replaced my actual down comforter with this. It’s just as warm, but without feeling the poking feathers in down. Reversible gives more options for decorating. I got it today! I was so excited because it was soft and silky and nice and fluffy. I washed it, in cold water on gentle and when I went to get it out of the washer, it was busted. Ripped all down the seam with stuffing hanging out. I'm so mad. I was looking so forward to this stupid thing, now I have to ship it back. I was super pleased with the quality of this comforter. The colors were as pictured (I bought the beige/green one) and the weight of the comforter was just how I prefer it - a bit heavy. It's really cozy and warm and fit our bed well. I purchased a king size for our queen bed as I like to have the sides hang down a bit more. The comforter did come with a slight odor (nothing too strong) so I washed it, and it washed/dried well and the odor was eliminated. For the price I couldn't have been more happy with the purchase. I'll likely buy the purple one for my daughters bed as well. I was disappointed in the quality of the cover material. It was very thin. The down material bunched into the edges and it kept slipping off the bed. It was not very warm and I had to put on about three extra blankets to keep warm. I replaced it with a regular quilt which is much better. Very soft and comfy and will keep you warm. Gets a little lumpy and definitely get the next size up so it covers the bed properly unless you want it to just cover the top. Love this comforter! Been using 2 1/2 years and it still in awesome shape! Feels like an expensive down but it wasn’t! Super super soft and I love it! Looks great, comfortable, not to hot & not to cold, just right! Stitching has held together nicely after multiple washes and the color hasn't faded either. I have bought this item before and is very comfortable and warm that I ordered 2 more for gifts and are very affordable. I would and recommend this reversible down alternative comforter. I have three of these blankets. They are thick and nice. They have a pretty good comfort range but still can get a little warm if it isn't cold enough. This comforter would be great for a kids room, but it is obviously very cheap material and the colors (mine is reversible blue) make it look cheap. I purchased four of these for my nieces and nephews. They are very comfortable. They wash well and last a long time. They are a great valu and I would order them again. Wonderfully warm alternate to down. It’s just as warm, but without feeling the poking feathers in down. Reversible gives more options for decorating. Not super heavy yet extremely warm. I don’t like a lot of heavy stuff on me in bed (I’m older and hot all the time). I have washed it once already and it fit in my LG front loader washer so I’m happy as can be! I'm very happy with the quality of this comforter! It's soft and silky and holds up well to frequent machine washings. I hadn't read the description thoroughly enough to see there's no pillow sham with it, as shown in the pic, so just be sure to read descriptions. "What is the fill weight of the twin XL?" "What is the weight and fill powet?" I love this comforter! It is not heavy, but it's supper cozy. My husband loves it because it's not to heavy. We only use a sheet and this comforter on our bed. ANd even on the cold nights it's enough. "What size of duvet cover matches this 68 inches wide x 90 inches long twin size comforter ?" It is not a duvet cover but a comforter. King size fits my King sized bed. "What is the size of duvet cover I need for this ? I mean with numbers since Twin size and other sizes can be a little different. Thank you." There will be slight variations in standard duvet sizes, however, if you order a twin size, it should accommodate this comforter just fine. "Why was a different color subsituted for the color I ordered First time ordering from you Very upset"
We apologize for the mistake. Please contact Overstock Customer Care at 1-800-The-BIG-O (843-2446) for assistance. "The stated dimensions of the King size are 90 wide and 106 long.......I assume this is the other way around!?" Hello Dixson, the comforter measurements are correct. Thanks for shopping with us! "Does this comforter come with the shams pictured?" Hello Jeanne726, this item is for the comforter only. Thanks for shopping with us!